from its intended target, creating an opportunity to escape to safety. open mind and approach life with an empty cup anything becomes possible. To define Aikido we look at the kanji. 合Ai (pronounced eye) This kanji means harmony as well as meeting. 氣 Ki (pronounced key) This kanji means energy. 道 Do (pronounced dough) This kanji means way or path. 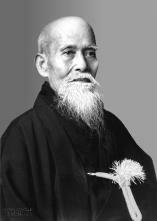 My definition of Aikido is then: The way of harmonizing meeting energies. This is after all what we do with every single technique.